Nocardia crassostreae (Actinomycete bacteria) causes infection in the oysters Crassostreae gigas and Ostrea edulis. The bacteria can be found all year as bacterial foci primarily in gonadal follicles, vesicular connective tissue, gills, heart and adductor muscle, but they can finally invade every tissue. Picture: Nocardia crassostreae bacterial colonies in the adductor muscle of Ostrea edulis (H&E staining). Nocardia crassostreae is an Actinomycete bacteria in the Nocardia otitidiscaviarum rRNA sub-group. The bacteria are usually associated with mortalities during the late summer and fall. The extent of associated mortalities has not been accurately measured but estimated at about 35% in some localities. In British Columbia (Canada), European flat oysters Ostrea edulis cultured alongside infected C. gigas have been found infected by N. crassostreae but mortality rate is unknown. Recently, a few flat oysters and Pacific oysters from The Netherlands (Lake Grevelingen) have been found infected by N. crassostreae during mortalities due to poor environmental conditions (Engelsma et al, 2008). Imprints of tissue – particularly mantle or adductor muscle with yellow-green pustules – show Gram-positive, acid-fast, branched colonies of filamentous bacteria. Histology is the current screening technique. Dense clumps of Gram-positive and PAS-positive (Friedman, Beattie et al. 1991), branching, beaded, basophilic bacteria surrounded by haemocytes can be seen in most organs. Though Hematoxylin and Eosin staining does not specifically stain the bacteria, colonies can be easily distinguished from surrounding tissue (see picture). A new PCR technique incorporating a lysozyme treatment after proteinase K digestion of tissue has been recently developed (Bower, Goh et al. 2005). This PCR technique uses two primers specific of Nocardia crassostreae. Previous ISH technique by Art Gee (unpublished data) developed by using a primer as a probe is non species specific and so has no value as a confirmatory technique. Further research is needed to get an ISH probe by designing a specific probe from the product of the PCR described above. Sequencing of 16S rRNA can be used after culture of bacteria on Brain Heart Infusion (BHI) agar plates (Friedman et al. 1998). The GenBank/EMBL accession numbers for the sequences reported by Friedmann et al. are: U92799 and U92800. Culture of Nocardia crassostreae on special media is needed for DNA extraction and sequencing. The last PCR technique (Bower, Goh et al. 2005) is now species specific and so can confirm a suspected case of Nocardia crassostreae infection. The PCR technique seems to be more sensitive than histology for the very low or early infections but needs to be validated. Sequencing after bacteria culture is too costly to be used as routine confirmatory technique. What should we do for diagnosis at suspicion? Nocardia crassostreae infection can be suspected when green or yellow pustules are visible on the mantle or adductor muscle but these are not specific symptoms and can also be observed on oysters infected by other organisms (e.g. Mikrocytos mackini). Imprints of pustules can be stained by a Gram technique. Small pieces of tissue including pustules or immediately around should be excised and frozen or fixed in ethanol for a PCR test. Remaining of the oyster can be fixed in Davidson’s for histopathology examination. Not listed by the EU legislation. Not listed by the OIE Manual of Diagnostic Tests for Aquatic Animals (2009 version) nor by the Aquatic Animal Health Code (2009 version). For confirmation, imprints of pustules can be stained by a Gram technique, and isolation of the bacterium may also be done. Small pieces of tissue including pustules or immediately around should be excised and frozen or fixed in ethanol for a PCR test. Remaining of the oyster can be fixed in Davidson’s for histopathology examination. Histology is the current screening technique. Engelsma M.Y., Roozenburg I. and Joly J-P. (2008). First isolation of Nocardia crassostreae from Pacific oyster Crassostrea gigas in Europe, Diseases of Aquatic Organisms 80: 229-234. 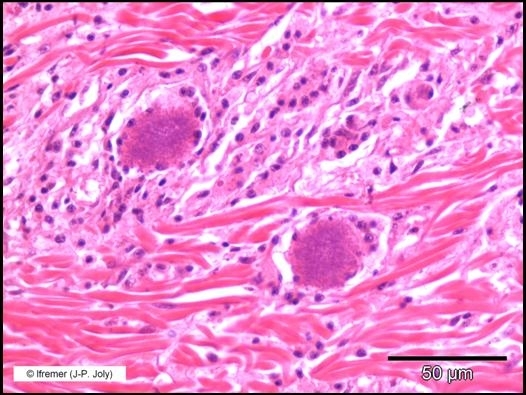 Bower, S. M., Goh B. and Meyer G. R. (2005); Epizootiology and detection of nocardiosis in oysters. In P. Walker, R. Lester and M.G. Bondad-Reantaso (eds). Diseases in Asian Aquaculture V, pp 249-262. Fish Health Section, Asian Fisheries Society, Manila. Friedman, C. S., B. L. Beaman, et al. (1998). Nocardia crassostreae sp. nov., the causal agent of nocardiosis in Pacific oysters. International Journal of Systematic Bacteriology 48 Pt 1: 237-46. Friedman, C. S., J. H. Beattie, et al. (1991). Investigation of the relationship between the presence of a Gram-positive bacterial infection and summer mortality of the Pacific oyster, Crassostrea gigas Thunberg. Aquaculture 94(1): 1.